Pre-Congress courses are open during the Super Early Bird rate period for congress attendees only. If a course isn’t sold out we will open it on August 15, 2019 for open registration. All prices are listed in Canadian Dollars. Registrations are only confirmed once payment is successful. A registrant may be required to show proof of the payment category they select at the registration table or pay the difference (ex: student registration). Student registration is open to full-time students only- proof will be required at registration. Attendees are responsible for ensuring they meet any VISA and travel requirements to Canada. Cancellations will be accepted, and a refund issued until August 15, 2019 minus a $50 CAD non-refundable administration fee. 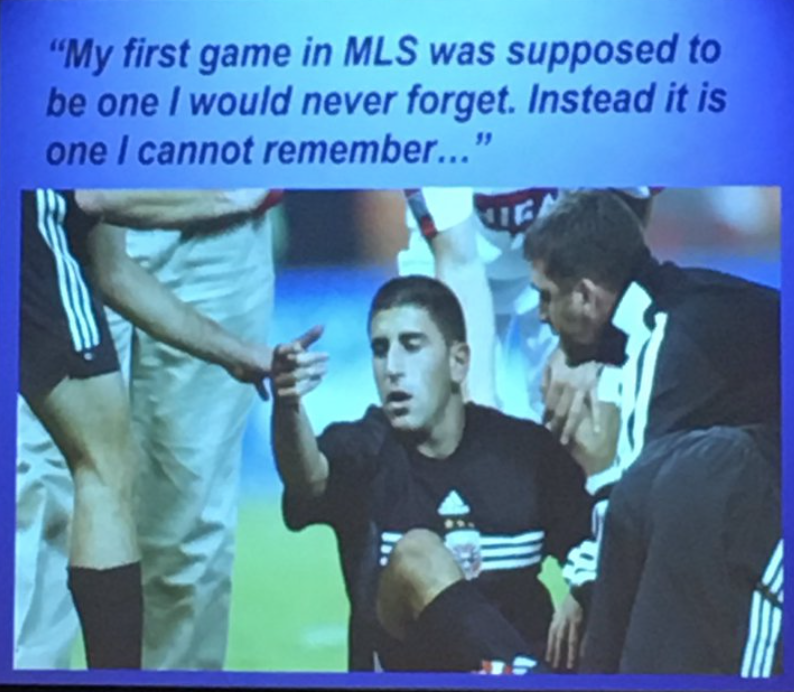 Any cancellations are to be sent and acknowledged by events@sportphysio.ca. Refunds will be applied to the credit card used to register. No refunds will be provided for cancellations after August 15, 2019. Name substitutions will be considered up to September 15, 2019. There will be no refunds granted for registrants who do not meet the conditions outlined above. If a registrant does not attend meals, receptions or coffee breaks included in the registration fee they will not receive a refund equivalent to the cost of the meal. 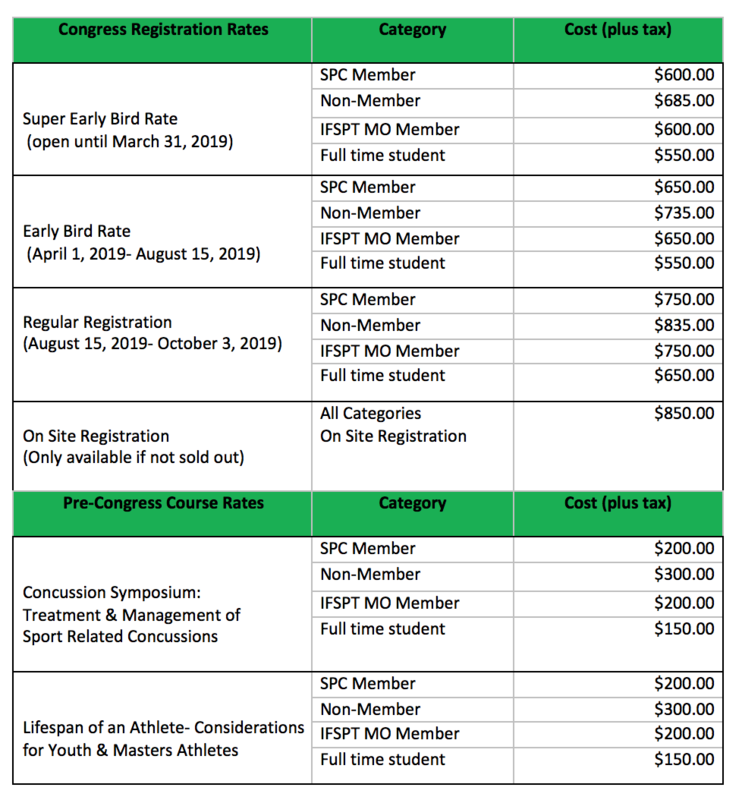 For registrants of only pre-congress courses: Cancellations will be accepted, and a refund issued until August 1, 2019 minus a $25 administration fee. Any cancellation is to be sent to and acknowledged by events@sportphysio.ca. Refunds will be applied to the credit card used to register. SPC reserves the right to cancel the pre-congress course if a minimum number of participants is not met. In this case, registrants will be provided with a full refund. The personal information gathered on the registration form will be kept private and only used for the event. Social media and photography may be used during the event. By registering for the event you are consenting that your photograph may be taken or a session may be recorded during this event. Please see the registration during the event for further information.